Suggested activities during your visit to Nice. Nice touristic map. 5 The old Nice and the Castel Hill The sizable hill that separates Old Town Nice from the Port of Nice is known as Castle Hill. 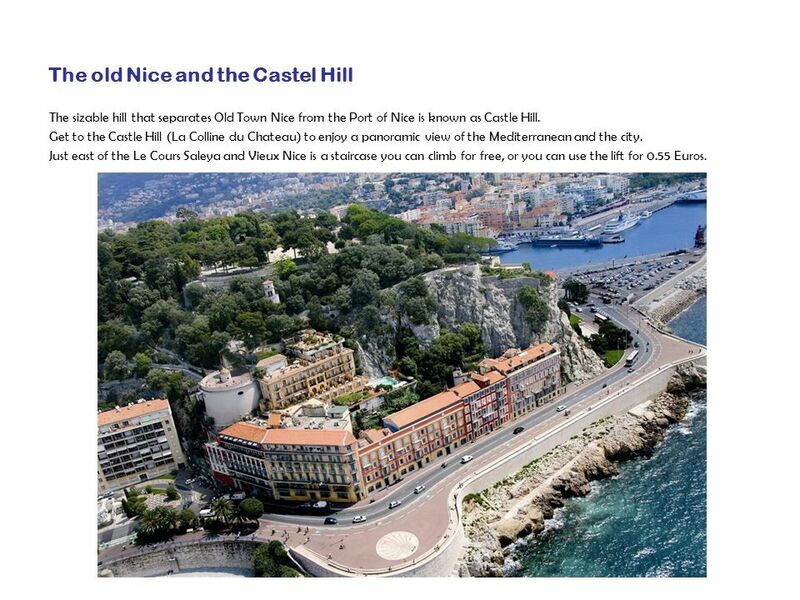 Get to the Castle Hill (La Colline du Chateau) to enjoy a panoramic view of the Mediterranean and the city. Just east of the Le Cours Saleya and Vieux Nice is a staircase you can climb for free, or you can use the lift for 0.55 Euros. 6 Russian Orthodox cathedral The Russian Orthodox Cathedral, Nice (Cathédrale Orthodoxe Russe Saint- Nicolas de Nice) is a Russian Orthodox cathedral, and a national monument of France, located in the city of Nice. Opened in 1912, thanks to the generosity of Tsar Nicholas II, it is the largest Russian Orthodox cathedral outside Russia. There is currently an ownership dispute over the property. The parish, which belongs to an overseas Russian Orthodox jurisdiction under the authority of the Ecumenical Patriarchate, opposes a claim on the property by the Patriarchate of Moscow, which has the backing of the Russian government(citation needed). The dispute seemingly stems from a conflict between old Russian nobility who have long since settled in Nice and newly arrived Russians. 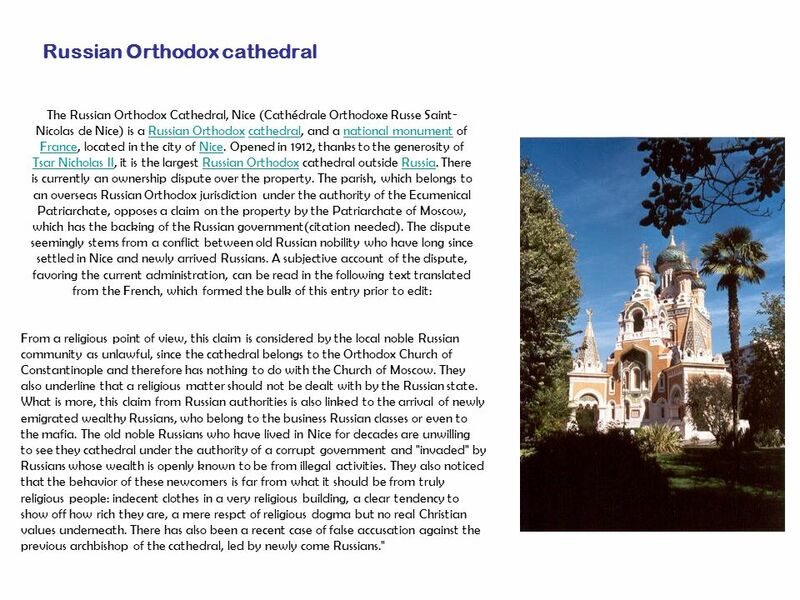 A subjective account of the dispute, favoring the current administration, can be read in the following text translated from the French, which formed the bulk of this entry prior to edit:Russian Orthodoxcathedralnational monument FranceNice Tsar Nicholas IIRussian OrthodoxRussia From a religious point of view, this claim is considered by the local noble Russian community as unlawful, since the cathedral belongs to the Orthodox Church of Constantinople and therefore has nothing to do with the Church of Moscow. They also underline that a religious matter should not be dealt with by the Russian state. What is more, this claim from Russian authorities is also linked to the arrival of newly emigrated wealthy Russians, who belong to the business Russian classes or even to the mafia. 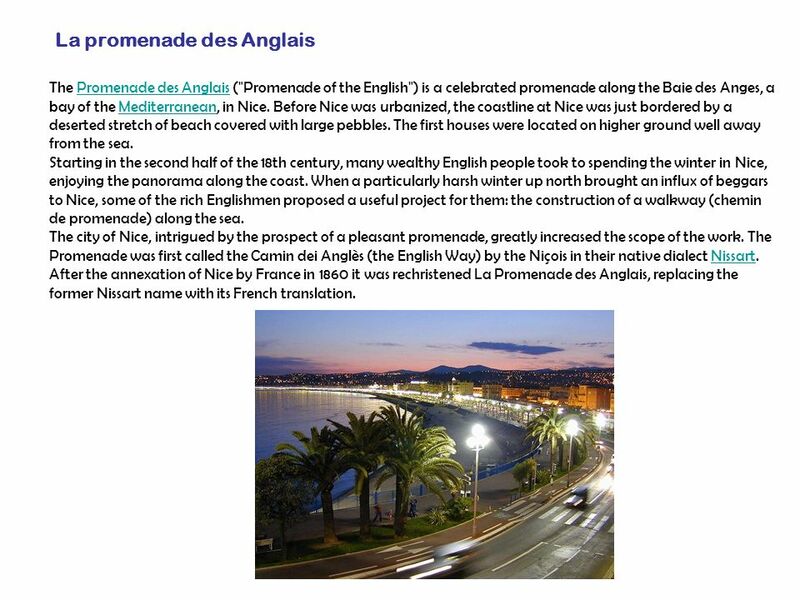 The old noble Russians who have lived in Nice for decades are unwilling to see they cathedral under the authority of a corrupt government and "invaded" by Russians whose wealth is openly known to be from illegal activities. They also noticed that the behavior of these newcomers is far from what it should be from truly religious people: indecent clothes in a very religious building, a clear tendency to show off how rich they are, a mere respct of religious dogma but no real Christian values underneath. There has also been a recent case of false accusation against the previous archbishop of the cathedral, led by newly come Russians." 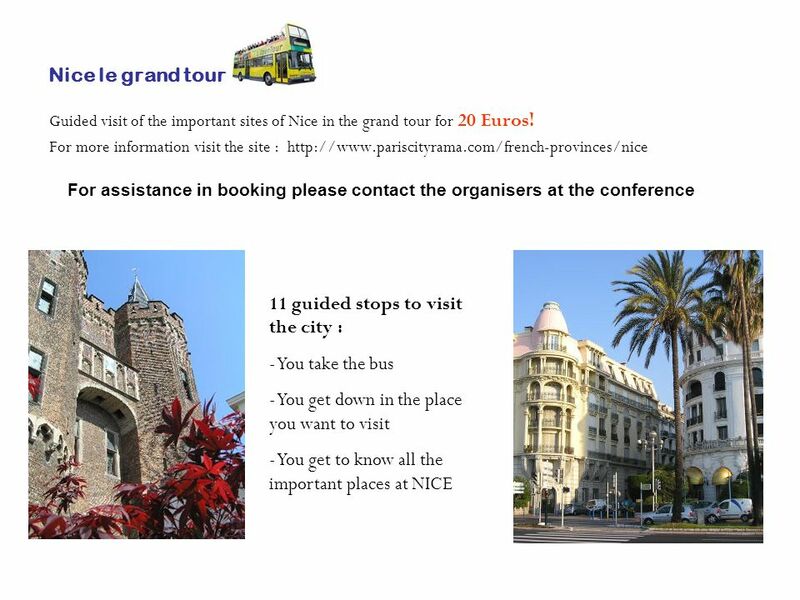 Download ppt "Suggested activities during your visit to Nice. 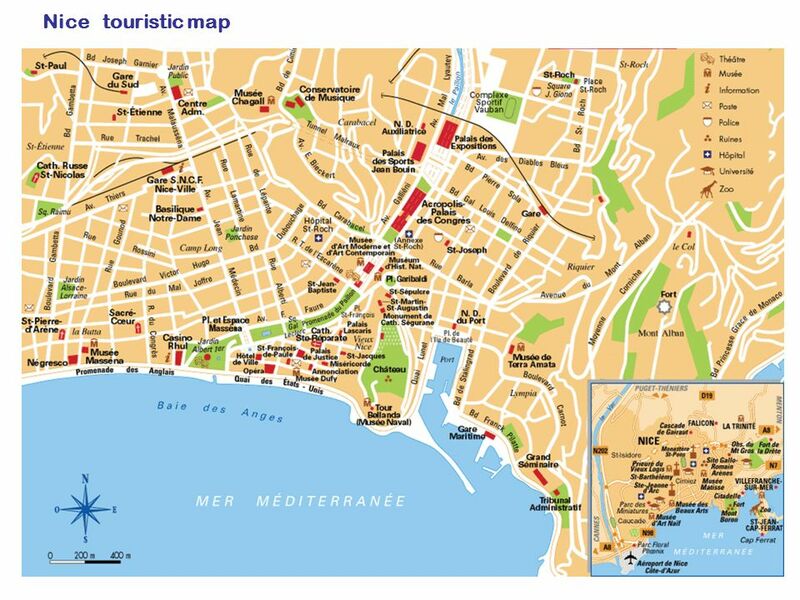 Nice touristic map." The City of Tours By Chae Won Park Giant Cedar Tree. HW #12 Donald Sterrett 10/01/2007. The Romanov Dynasty The Romanov Dynasty begins with Michael in 1613 and ends with Nicholas II in The Romanov. Description of Marseille Marseille is a big city, it is the second largest city of France. There are inhabitants in this city that measures 240km². Day 1: Granada - Orientation, City Walking Tour, Tapas The first day in Granada includes a walking tour of the city. Local guides will show the tour group.  Sparrow Hills are known as Lenin Hills( between 1935 and 1991).  They are hills on the right bank of the Moskva River and one of highest points in. Marseille Grenadine 2 Unité 2. Marseille Marseille is a city surrounded by hills and opened to mediterranean sea French most important seaport city with. History and Governments of RUSSIA Part 1. Early Russia 1- From what people did modern Russians descend?. RUSSIA WHAT ATTRACTS TOURISTS TO RUSSIA COAT OF ARMS. Geography Of France. Objectives Identify France on a blank map of Europe. How do France’s borders protect it? What is the weak point in France’s border? Basse-Normandie et Haute-Normandie. Basse-Normandi e Lower Normandy. History of Bretagne  Breton history, as they call it dates back to before 5000 B.C.  In the north-west of France, Bretagne lies on a peninsula that. Nice. Nice, a beautiful & sunny city  300 days of sunshine per year  5th biggest city in France  Top tourist city in France after Paris with 4 million.